From 24th January till 5th May 2019, we present Wild Rumpus – an invitation into an imaginary world of creatures big, small, flurry or gentle, and to make friends with whoever is hiding behind the corner. Embrace the world of tactile material and feel what it is like to hug, cuddle and squeeze into something out of the ordinary. Entry into The Artground itself is free and donations are encouraged. The Artground occasionally plays host to ticketed performances and workshops. This weekend we present a ticketed performance, Baby Space – an immersive performance strictly for pre-walking babies, created by Dalija Acin Thelander. Patrons are required to purchase tickets online if you’d like to attend. (Link provided below). Children will also get to enjoy drop-in Open Craft Workshops, where they can drop in anytime within the 2 hours (subject to seat availability). Each child will take approximately 10 – 30 mins for each activity. Each activity is charged at $10 per child. There is no registration for these activities as they are first come, first served (unless stated otherwise). Fingerprint Badges By Wah so simple! For Drop-in Open Craft Workshops, children can drop in anytime within the 2 hours (subject to seat availability). Each child will take approximately 10 – 30 mins for each activity. 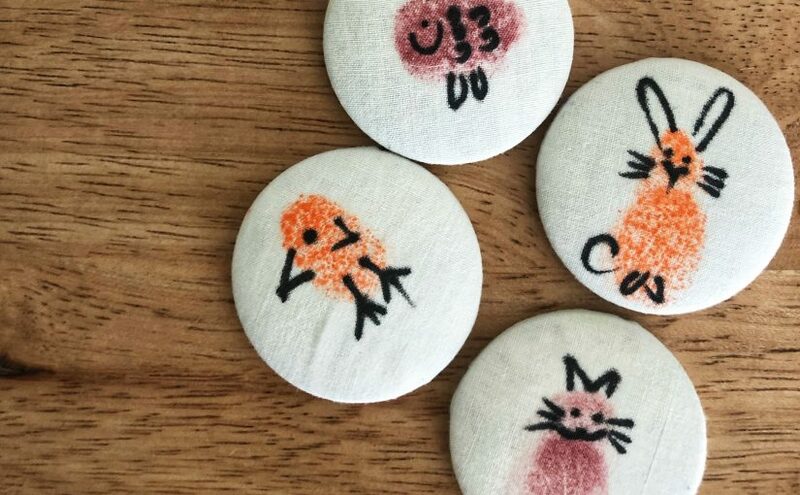 Fingerprint Badges: By Wah So Simple (Suitable for ages 18 months and up): Create art with your fingers! Come and join us make fingerprint badges at this session. For children 18 months and up. Parental guidance required for children 3 years and below. Bunny pom pom bookmark! : by Stan (Suitable for ages 3 years and up): Make adorable bunny bookmarks!